I may have to update that statement. Today, Pokemon Let’s Go: Eevee/Pikachu editions released on the Nintendo Switch and they are a very different beast. The title is a reference to the Pokemon Go mobile game. That’s because the catching system is based on the mobile game, not the mainstream games in the series. You no longer risk being knocked out and losing your progress to catch other Pokemon. There is no battling necessary anymore. It’s just like Pokemon Go, only large enough for you to see what you’re doing. You walk into a Pokemon (you can always see them hiding in the grass now) to open the catch mode. You can feed the wild Pokemon berries to increase your chance of catching it. Then, you hit the “Get Ready” button to take control of the catch. I’m playing in tablet mode because I’m used to Pokemon games being handheld games. That means I can tilt the screen up and down, left and right to center my cursor on the Pokemon and try to catch them. It’s the same visual mechanic as the mobile game—a green, yellow, or red ring shrinks in size around the Pokemon, making for a harder throw but a better chance of catching the Pokemon if it hits. You only have to hit the X button rather than swipe, so it’s even easier than mobile. Everything else is playing like a regular Pokemon game so far. Specifically, it’s playing like Pokemon Yellow on the Game Boy. You catch your first Pokemon by chance (either Eevee or Pikachu) with the help of Professor Oak. Your new companion Pokemon does not stay in the pokeball and actually rides around on your hat. You can also choose one other Pokemon in your party to follow behind you on your journey. You encounter trainers and battle like normal. Gym battles are a return to the original style, as well. I audibly squeed when Eevee first popped up. I don’t know what will happen when my main, my favorite, my lifelong Pokemon buddy Jigglypuff enters the battle. This is not a review as I haven’t completed the game yet. I just had to get ahead and breakdown the new mechanics. The game is really pretty even on the tablet (and gorgeous when broadcast to a TV). You can play with your party Pokemon and even dress up your Eevee or Pikachu. I don’t always make the best strategic decision in a Pokemon game as I’m drawn to the so cute you wanna die style of Pokemon. Hence, when I do review, it will be Eevee and not Pikachu. Eevee is floofier and more worthy of being booped on the snoot. 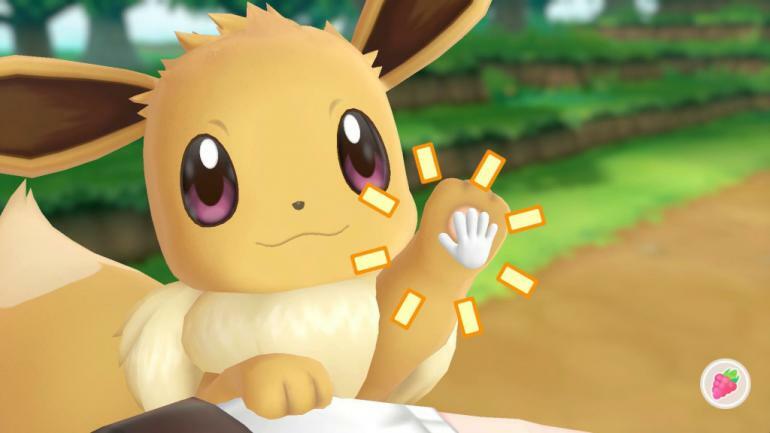 Pokemon Let’s Go: Eevee and Pikachu editions are available on traditional cartridge or digital download on the Nintendo Switch.